Sometime on July 9, 1797, Hannah Holland strode into her bank to get a loan. She learned the next day that her application had been successful but the news barely affected her busy day. The businesswoman had received bank loans in the past and would receive many more in the future. Though a small percentage of all bank customers, women held accounts in many northeastern banks in the early national period. The finding raises doubts about the belief that the Revolution proscribed women's economic behavior but supports the view that, whatever the exact extent of their rights and powers, women remained second-class denizens of early America. The Revolution and subsequent ideological movements did not prevent women from joining the economy. 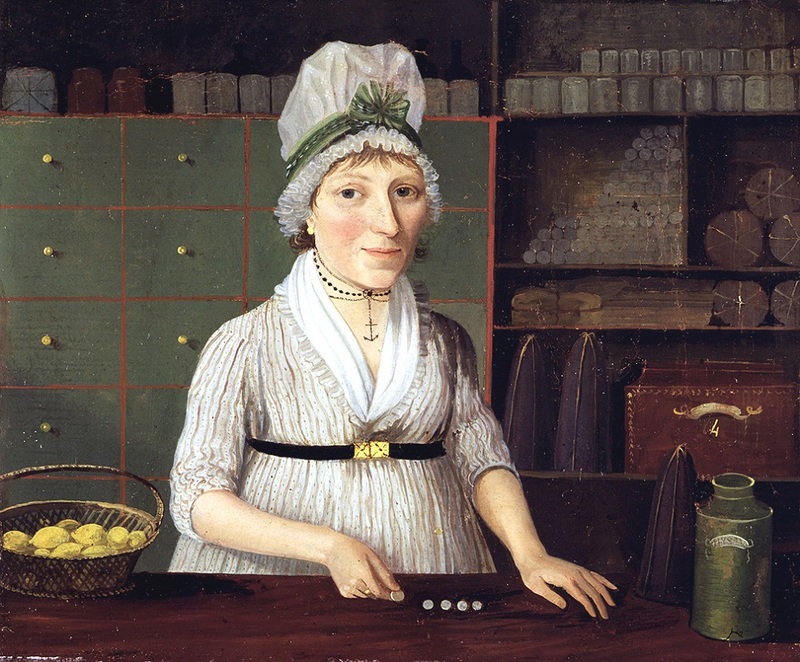 Important to the colonial economy, women, be they single, married, or widowed, could and did create meaningful niches for themselves as skilled artisans and retailers. Except for certain coverture restrictions, most women could engage in all types of financial contracts necessary to engage in commercial banking. Though a small percentage of all commercial bank customers, women were bank shareholders, depositors, and loan recipients. The Revolution created the need to bank and invest for both sexes. Although records are far too sparse to describe women's participation in early banking with any degree of precision, the following survey of women's economic activities in the early national economy shows some women indeed were commercial bank customers, and women were certainly a major class of noteholders. Though exaggerated, the reports that William Duer and his cohorts borrowed heavily from "widows and orphans" in the years and months leading up to the Panic of 1792 seem to have some basis in fact. As early as 1790, for example, Mrs. Elizabeth B. Hatter drew on Duer "at thirty days sight for Four Hundred Dollars ... being on accot. of the Ballance due me [George Reid] by Royal Flint Esq." Duer also involved his wife Kitty in his infamous financial schemes. "Received your letter my dear love, this morng," Mrs. Duer began. "I am sorry it did not arrive in time to have done the Business in Bank on saturday," she continued, adding that she had "managed to take up the notes by borrowing 1100 dols of Rosevelt." Kitty ended her very businesslike letter by informing William: "I am obliged to make large drafts on your cash on acct of the expense of moving." After Duer's failure lead to a minor financial panic, Alexander Macomb's wife pledged that her "own little property shall go towards the maintenance of the Family with pleasure." Women also bought and sold government securities. Women owned Continental securities. During the liquidity crisis of 1784, widow Marian Maxwell advertised that "Cash, Bills of the New Emission, and any other Security of the State of New-York will be taken in payment, at their current value" for her husband's estate. Philadelphia shopkeeper Ann Robertson instructed her executors to invest the proceeds of her estate "into the funds or public securities," by which she certainly meant the federal bonds Alexander Hamilton created in the early 1790s. Agents heartily encouraged women to buy lottery tickets. Women's benevolent associations, like "The Association for the relief of respectable aged indigent females," invested in equities. From Treasurer Sally Lockwood's report it is clear that the organization gave their wards cash, wood, and tea. The organization paid for these goods from donations, of course, but also received a "dividend on Stock in Mechanics Bank $40.50." In fact, one of the best investments a widow or young lady could make was in bank stock. Most New York banks, especially early ones, were extremely stable, and, unlike long bonds or leases, their dividends tended to fluctuate in the same direction as general prices. This eased the burden of price inflation. Considerable numbers of women owned insurance and bank stock (equities). Eleven of the 89 persons and companies who held stock in the Insurance Company of North America from 1792 until 1799 were women. Similarly, some 53 of the Manhattan Company's first 388 subscribers were women. Of course, at the time of subscription it was not clear to everyone the Manhattan Company was going to be a bank. Many of these women subscribed in order to give the Livingstons, Ludlows, and other families a controlling share of the stock. These women owned the stock outright, however, and could theoretically cast their votes, or give their proxies, to whomever they chose. Women throughout the Northeast invested in the stock of other banks too, of course. A considerable number of women owned stock in the Bank of Pennsylvania in the mid-1790s. Like other property, married New York women could own bank stock on their own account, and they did not lack the legal support of male attorneys when pursuing their rightful claims. "It is a glorious cause to argue," financier Jacob Barker told attorney Benjamin F. Butler, "being against the Husbands right to dispose of Bank stock settled on his wife by her late father." Stock ownership often entailed borrowing privileges for men and women alike. Personal records show that women could get discounts at bank, even the Bank of the United States, but the records are not a systematic means of quantitatively determining women's bank use. Extant bank ledgers, though few, yield some limited data regarding the degree of women banking. In 1790, 2.68% of the Bank of North America's almost 1,600 customers were women. A decade later, women composed 5% of the Bank's customer base. In 1791, shopkeepers Anne and Sarah Ashbridge wrote 121 checks, mostly to important Philadelphia businessmen like John Chaloner. They met these drafts by making 49 deposits, about one a week, ranging between $50 and $225. That same year, the throughput (credits) of shopkeeper Mary Rhea's account topped $13,500. In general, women used banks for the same reasons as men: to safeguard money, to make disbursements by check, and to increase liquidity. In other words, women used banks to improve their business and personal finances. Though some women, like some male customers, used the bank only to store funds which they withdrew in cash, most disbursed their credits by writing checks. Many women customers received bank discounts. That is, the bank loaned them money on the security of a promissory note or bill of exchange. This allowed them both to extend their businesses and to conduct their operations more safely i.e. with less chance of insolvency. Whatever the exact numbers in particular times and places, it is clear that, in New England and the Middle Atlantic states anyway, there were no legal restrictions, outside of coverture, to women's bank use. In other words, women could engage in every type of activity needed to bank. Women could also make, receive, and endorse checks, even epistolary checks. Alexander Hamilton's wife Elizabeth, for example, had the power to draw checks against Hamilton's account in the Bank of the United States.